The internet has been buzzing about a new "Stop Online Piracy Act" (SOPA) that, if passed, would require ISP's to blog sites that to contain links to copyright protected material. A simple example. If someone where to post a link here on baekdal.com (in e.g. the comments) to a YouTube clip from a movie, the movie studies could blacklist my site at the ISP level, without due process, court order, or anything. Not only could they block my site, they would also have the power to block payments from Paypal and ad revenue from Google AdSense. If I don't actively check and verify everything other people post ..."bang!!" ...I'm out of business. The far reaching consequence of this is absolutely insane. I am not a criminal, I did not post the link. I am victim just as much as anyone else. How would I even know if the link is illegal? Sure it would be easy to tell for pirated versions of big hollywood videos, but what about videos from sources I don't know. I don't know if another person has the right or not to post it. And how can the US Government even contemplate giving private companies the power to shut down legitimate business' without going through the courts? I am absolutely outraged by this, and like everyone I am advocating against the "Stop Online Piracy Act" ...but there is a problem. The main arguments against the "Stop Online Piracy Act" are that the internet needs to be free, uncensored and open. And if we put the burden of proof on the website owners (who are themselves innocent) the risk and cost of doing business online would increase substantially. That is all true, but it is terrible excuse. It's like saying that we should accept that people steal and distribute other people's content, because blocking it would be bad. If that is the best counter-point people can come up with, the "Stop Online Piracy Act" will be a reality. The content owners will just say that they only go after the criminals. And everyone has to agree that we need to censor the criminals. Take a site like the one pictured below. 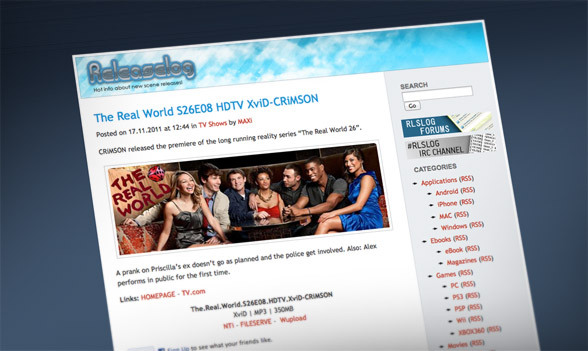 Its entire purpose is to help people find every movie or TV show illegally. Piracy is very real. The problem is that we are discussing the wrong thing and trying to solve the wrong problem. It's like creating a "Stop Shoplifting Act" saying any company who's product has been stolen in a Wallmart store, can close that store. It makes no sense, but neither does any argument against it, because none of the arguments actually stops people from shoplifting in the first place. We need to solve the right problem. Specifically we need to solve three problems. Why do piracy exists? Well, some are doing it simply because they don't want to pay ...for one reason or another. That, of course, is just simple theft. If you take someone else's product, without paying the price the owner has defined. You are shoplifting. Pure and simple! But there is a bigger reason why people pirate content. It's a revolt against discrimination. This is discrimination. What the movies studies are saying is because my "skin color" is "Viking" I'm not allowed to watch this movie. I have to go back to being a second-class citizen and wait for the "pure skins" from the US to watch it first. There is no difference between this and the black and white discrimination of the past. They are saying that because I'm a black person (metaphorical speaking) I'm not allowed in. And it goes both ways. Spotify was forced to block their services to people in the US for a very long time, because the record industry insisted on discriminating their global audience. And we see it with the media. AOL editions can only be read on the iPad ...and only in the US. Discrimination has nothing to do with skin color. Discrimination is when you value one demographics higher than another. Or when you create restrictions based on nationality, location, or method of use. The main reason why piracy exists is because people are revolting against the "white corporations" who discriminate against them. When people see the message above, are you surprised that they find other ways pirate the movies instead? No law can ever solve the problem of piracy as long as people are being discriminated against. It doesn't matter what that laws say, or how stupid it is formulated ...as long as content owners discriminate, piracy is going to continue - and likely grow. People feel justified to act! So the first law we need to make is that it is "illegal for any company to discriminate against people based on gender, age (child protection excluded), race, religion, culture, nationality, or location." The second law we need to create is that it should be illegal to violate anyone' privacy. Notice I'm writing privacy not piracy (two very different things). The reason for this is quite simple. We need to find a way to punish the criminals and protect the innocent (not the other way around as we do today). To do that we need internet authentication. We need to associated all actions taking online with the person doing the act. That means we need to record everything a person does for a specific period of time (e.g. 60 days back). Privacy advocates would be outrages by this, because it means that everyone would be tracked ...and come up with arguments like "the Governments in Tunisia, Suria, Egypts and Libya could have used that information to pinpoint their opponents". The problem is that every government, even the US Government, has passed laws that allow them to violate normal people's privacy in the interest of national security. As long as they are doing that. The only way that we, legitimate private citizens, can act against this injustice, is for us to keep the internet anonymous. Of course, the downside is that anonymity also protects the criminals. We need to fix that, because protecting a criminal's right for anonymity, is not helping anyone (just look at how much time and money everyone is spending on internet security). The only way we can do this is to make it illegal for anyone to violate anyone else's privacy - unless it is in the case of a criminal investigation sanctioned by a court order. Only the police investigator is allowed to look at your browsing history, if, again, the court has issued a court order allowing that very specific search. And not only should it be illegal to violate someone's privacy. It should also be punishable to the furthest extend of the law. We are talking jail time to anyone who looks at the log files without the court order. And to protect your privacy, only one organization is allowed to log the data. This could be the FBI, which will then be legally responsible for protecting your privacy, and only they can look at the data when a court order is issued. 3. All internet traffic should by law, be authenticated and logged for a specific period of time. And the ISPs can only allow authenticated requests to pass through their systems. The third law we must pass is that all traffic must be authenticated and logged. This means that everything you do, everything you post, and everything you share is logged and linked to your personal identification. This is actually surprisingly simple to do, because the ISPs already know who you are. The ISPs are doing the logging, but the FBI is the one who is storing the data. (the ISPs is not allowed to store any log files, because that would violate your right to privacy). Imagine a person uploading a video to YouTube, one that he doesn't own, like the full version of Pixar's new shot movie "Hawaiian Vacation". That person would have no moral excuses for his action, because, with the no discrimination law, anyone could just buy it and watch it anywhere. The copyright owner, in this case Disney, will then go to the courts and ask for a court order to identify the culprit. The court grants the court order, because, giving the evidence, he is clearly pirating the content. At the same time, an automated take down notice is sent to Google, which removes the video from the site. The FBI is ordered to search the logs and find who is behind posting that video to YouTube, which would be easy since every request is authenticated. Disney is provided with the identity of the culprit, and sues (and most likely wins). After a relatively short period of time, piracy on YouTube is over. Everyone uploading illegal content is immediately caught. This obviously doesn't prevent people from doing it, but you cannot get away with it either. At the same time, anyone else using YouTube - and Google - are free to use and improve their service. Google (being a victim too) is never even involved. The takedown notice can be fully automated, and doesn't require an expensive legal or support team to operate (which is very important for startups). Case study: A person posts a link to an illegal version of an ebook on Twitter. Since we have a no discrimination law, there is again, no moral excuse for pirating. People can buy and use the original book anywhere. The publisher's social media monitoring tools identifies the link and goes to the court to get a court order. The court order is granted (again based on the overwhelming evidence). At the same time, an automated take down notice is sent to Twitter identifying the post, who then deletes it. The FBI is ordered to search the logs and identify the poster. The publisher is provided with the identity and sues the person posting it. We need all three laws. We need an anti-discrimination law to protect people natural right to buy and consume products as equals. We need a law that protects our privacy, and punishes violations to furthest extend of the law. And when we have that, we need a law that requires that all internet traffic is authenticated and logged, so that the criminals can be tracked down. Everyone would still be able to browse the internet anonymous, nobody would know who you are ...until you commit a crime and the courts authorizes the FBI to identify you.